This article is about the region of California. For other uses, see Central Valley (disambiguation). The Central Valley is a flat valley that dominates the geographical center of the U.S. state of California. It is 40 to 60 miles (60 to 100 km) wide and stretches approximately 450 miles (720 km) from north-northwest to south-southeast, inland from and parallel to the Pacific Ocean coast. It covers approximately 18,000 square miles (47,000 km2), about 11% of California's total land area (or about the size of the Dominican Republic). The valley is bounded by the Sierra Nevada to the east and the Coast Ranges to the west. It is California's single most productive agricultural region and one of the most productive in the world, providing more than half of the fruits, vegetables, and nuts grown in the United States. More than 7 million acres (28,000 km2) of the valley are irrigated via an extensive system of reservoirs and canals. The valley also has many major cities, including the state capital Sacramento; as well as Chico, Redding, Stockton, Modesto, Fresno, and Bakersfield. The Central Valley watershed comprises 60,000 square miles (160,000 km2), or over a third of California. It consists of three main drainage systems: the Sacramento Valley in the north, which receives well over 20 inches (510 mm) of rain annually; the drier San Joaquin Valley in the south; and the Tulare Basin and its semi-arid desert climate at the southernmost end. 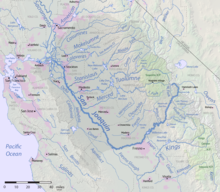 The Sacramento and San Joaquin river systems drain their respective valleys and meet to form the Sacramento–San Joaquin River Delta, a large expanse of interconnected canals, stream beds, sloughs, marshes, and peat islands. The delta empties into the San Francisco Bay, and then ultimately flows into the Pacific. 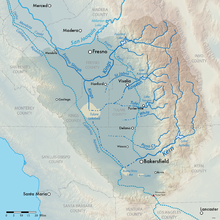 The waters of the Tulare Basin essentially never flow to the ocean (with the exception of Kings River waters diverted northward for irrigation), though they are connected by man-made canals to the San Joaquin and could drain there again naturally if they were ever to rise high enough. The valley encompasses all or parts of 18 Northern California counties: Butte, Colusa, Glenn, Fresno, Kings, Madera, Merced, Placer, San Joaquin, Sacramento, Shasta, Solano, Stanislaus, Sutter, Tehama, Tulare, Yuba, Yolo, and the Southern California county of Kern. The Central Valley is commonly known to residents simply as "the Valley." Older names include "the Great Valley," a name still often seen in scientific references (e.g. Great Valley Sequence), and "Golden Empire," a booster name that is still referred to by some organizations (e.g. Golden Empire Transit, Golden Empire Council, etc.). There are four main population centers in the Central Valley, each roughly equidistant from the next, from south to north: Bakersfield, Fresno, Sacramento, and Redding. While there are many communities large and small between these cities (see below), these four cities act as hubs for regional commerce and transportation. The flatness of the valley floor contrasts with the rugged hills or gentle mountains that are typical of most of California's terrain. The valley is thought to have originated below sea level as an offshore area depressed by subduction of the Farallon Plate into a trench further offshore. 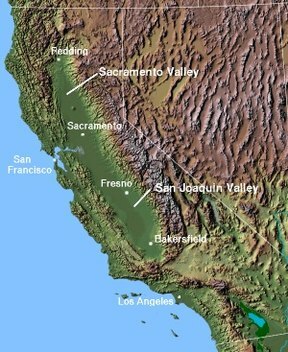 The San Joaquin Fault is a notable seismic feature of the Central Valley. The valley was enclosed by the uplift of the Coast Ranges, with its original outlet into Monterey Bay. Faulting moved the Coast Ranges, and a new outlet developed near what is now San Francisco Bay. Over the millennia, the valley was filled by the sediments of these same ranges, as well as the rising Sierra Nevada to the east; that filling eventually created an extraordinary flatness just barely above sea level; before California's massive flood control and aqueduct system was built, the annual snow melt turned much of the valley into an inland sea. The one notable exception to the flat valley floor is Sutter Buttes, the remnants of an extinct volcano just to the northwest of Yuba City, which is 44 miles (71 km) north of Sacramento. Another significant geologic feature of the Central Valley lies hidden beneath the delta. The Stockton Arch is an upwarping of the crust beneath the valley sediments that extends southwest to northeast across the valley. The Central Valley lies within the California Trough physiographic section, which is part of the larger Pacific Border province, which in turn is part of the Pacific Mountain System. Central Valley seen from space. The "Central Valley grassland" is the Nearctic temperate and subtropical grasslands, savannas, and shrub lands ecoregion that was once a diverse grassland containing areas of desert grassland (at the southern end), prairie, savanna, riverside woodland, marsh, several types of seasonal vernal pools, and large lakes such as now-dry Tulare Lake (the largest lake in the United States west of the Mississippi), Buena Vista Lake and Kern Lake. However, much of the Central Valley environment has been removed or altered by human activity including the introduction of exotic plants, especially grasses. The oak woodlands and chaparral that fringe the valley have been categorized as the California interior chaparral and woodlands ecoregion. The wetlands have been the target of rescue operations to restore areas nearly destroyed by agriculture. The dominant grass of the valley was Nassella pulchra mixed with other species, but today only 1% of the grassland in the valley is original and intact. Grassland flowers include California poppy (Eschscholzia californica), lupins, and purple owl's clover (Castilleja exserta), which can still be seen, especially in Antelope Valley in the Tehachapi hills. Riverside trees include willows, western sycamore (Platanus racemosa), box elder (Acer negundo), Fremont cottonwood (Populus fremontii), and the endemic valley oak (Quercus lobata). The Central Valley was once home to large populations of pronghorn antelope (Antilocapra americana), elk including the endemic tule elk subspecies (Cervus elaphus nannodes), mule deer (Odocoileus hemionus), California ground squirrels, gophers, mice, hare, rabbits and kangaroo rats, along with their predators including the San Joaquin kit fox, which is now an endangered subspecies surviving on the hillsides of the San Joaquin Valley. The wetlands of the Valley were an important habitat for wintering waterbirds and migrating birds of other kinds. Reptiles and amphibians of the valley include the endemic San Joaquin coachwhip snake (Masticophis flagellum ruddocki), blunt-nosed leopard lizard (Gambelia sila), Gilbert's skink (Eumeces gilberti) and the western aquatic garter snake (Thamnophis couchii). There are also a number of endemic invertebrates. The Central Valley is also home to a wide variety of endemic fish species, including the Sacramento Pikeminnow, Sacramento Perch, Sacramento Blackfish, and Sacramento Splittail, among others. Agriculture, especially the creation of grazing land, and the draining of lakes and rivers have radically altered the habitats of the Valley. Most of the grassland has been overtaken by new species, most of the vernal pools have been drained or otherwise destroyed with only those on the higher slopes remaining, the marshland has mostly been drained too, and the riverbank woodlands have nearly all been affected. The Great Valley Grasslands State Park preserves an example of the native grass habitat in the valley, while oak savanna habitats remain near Visalia. There are areas of wetland and riverside woodland in the north especially on the Sacramento River system including the Nature Conservancy's Cosumnes River Preserve just south of Sacramento, Gray Lodge Wildlife Area, Butte Sink Wildlife Management Area, and other patches in the delta area. Remaining vernal pools include Pixley National Wildlife Refuge between Tulare, California, and Bakersfield and Jepson Prairie Preserve in the delta. There are large blocks of desert scrubland in the southern San Joaquin Valley and in the Carrizo Plain, which is just outside the valley but has a similar landscape. All these patches of natural habitat are disconnected and this is particularly damaging for wildlife that is used to migrating along the rivers of the valley, birds such as warblers and cuckoos, and reptiles and amphibians. Meanwhile, clearance and alteration are ongoing. The valley gives its name to Valley fever, which is primarily a disease of the lungs that is common in the southwestern United States and northwestern Mexico. It is caused by the fungus Coccidioides immitis, which grows in soils in areas of low rainfall, high summer temperatures, and moderate winter temperatures. These fungal spores become airborne when the soil is disturbed by winds, construction, or farming. This illness frequently takes many weeks or months to resolve. Occasionally Valley Fever is life-threatening and even fatal. Additionally, Central Valley farm laborers are often unable to afford or physically access healthy foods, which is a form of food insecurity. Residents of the Central Valley also experience risk of contamination from pesticides when living in proximity of application sites. The northern Central Valley has a hot Mediterranean climate (Köppen climate classification Csa); the more southerly parts in rainshadow zones are dry enough to be Mediterranean steppe (BShs, as around Fresno) or even low-latitude desert (BWh, as in areas around Bakersfield). 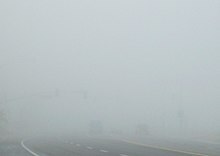 It is very hot and dry during the summer and cool and damp in winter, when frequent ground fog known regionally as "tule fog" can obscure vision. Summer daytime temperatures approach 100 °F (38 °C), and common heat waves might bring temperatures exceeding 115 °F (46 °C). Mid-autumn to mid-spring is the rainy season — although during the late summer, southeasterly winds aloft can bring thunderstorms of tropical origin, mainly in the southern half of the San Joaquin Valley but occasionally to the Sacramento Valley. The northern half of the Central Valley receives greater precipitation than the semidesert southern half. Frost occurs at times in the fall months, but snow is rare. Tule fog /ˈtuːliː/ is a thick ground fog that settles along the length of the Great Central Valley. Tule fog forms during the late fall and winter (California's rainy season) after the first significant rainfall. The official time frame for tule fog to form is from November 1 to March 31. This phenomenon is named after the tule grass wetlands (tulares) of the Central Valley. Accidents caused by the tule fog are the leading cause of weather-related casualties in California. Two major river systems drain and define the two parts of the Central Valley. The Sacramento River, along with its tributaries the Feather River and American River, flows southwards through the Sacramento Valley for about 447 miles (719 km). In the San Joaquin Valley, the San Joaquin River flows roughly northwest for 365 miles (587 km), picking up tributaries such as the Merced River, Tuolumne River, Stanislaus River and Mokelumne River. The Central Valley watershed encompasses over a third of California at 60,000 square miles (160,000 km2), with 46 percent draining into the Sacramento River, 26 percent into the San Joaquin, and 27 percent into Tulare Lake. In the south part of the San Joaquin Valley, the alluvial fan of the Kings River and another one from Coast Ranges streams have created a divide and resultantly the currently dry Tulare basin of the Central Valley, into which flow four major Sierra Nevada rivers, the Kings, Kaweah, Tule and Kern. This basin, usually endorheic, formerly filled during heavy snowmelt and spilled out into the San Joaquin River. Called Tulare Lake, it is usually dry nowadays because the rivers feeding it have been diverted for agricultural purposes. The rivers of the Central Valley converge in the Sacramento-San Joaquin Delta, a complex network of marshy channels, distributaries and sloughs that wind around islands mainly used for agriculture. Here the freshwater of the rivers merges with tidewater, and eventually reach the Pacific Ocean after passing through Suisun Bay, San Pablo Bay, upper San Francisco Bay and finally the Golden Gate. Many of the islands now lie below sea level because of intensive agriculture, and have a high risk of flooding, which would cause salt water to rush back into the delta, especially when there is too little fresh water flowing in from the Valley. The Sacramento River carries far more water than the San Joaquin, with an estimated 22 million acre feet (27 km3) of virgin annual runoff, as compared to the San Joaquin's approximately 6 million acre feet (7.4 km3). Intensive agricultural and municipal water consumption has reduced the present rate of outflow to about 17 million acre feet (21 km3) for the Sacramento and 3 million acre feet (3.7 km3) for the San Joaquin; however, these figures still vary widely from year to year. Over 25 million people, living both in the valley and in other regions of the state, rely on the water carried by these rivers. Runoff from the Sierra Nevada flows into the Central Valley and provides one of the largest water resources of California. The Sacramento River is the second largest river to empty into the Pacific from the Continental United States, behind only the Columbia River and greater than the Colorado River. Combined with the fertile and expansive area of the Central Valley's floor, the Central Valley is ideal for agriculture. Today, the Central Valley is one of the most productive growing regions of the United States. But to enable this, water control was needed to prevent rivers from overflowing during the spring snowmelt while drying up in the summer and autumn. As a result, many large dams, including Shasta Dam, Oroville Dam, Folsom Dam, New Melones Dam, Don Pedro Dam, Friant Dam, Pine Flat Dam and Isabella Dam, were constructed on rivers entering the Central Valley, many part of the Central Valley Project. These dams have had a profound impact on the physical, economic, cultural, and ecological state of Central Valley: for example, enabling development of its vast agricultural resources but leading to the loss of the Chinook salmon. Post-World War II demand for urban development in California's urban areas, most notably the San Francisco Bay Area and the Los Angeles/Inland Empire/San Diego, required water resources to support it. Moreover, rapid development of agriculture in the southern Central Valley required far more water than available locally. The Feather River in the Sacramento Valley was looked to as a water source, leading to public financing of the California State Water Project. This transports water to the southern San Joaquin Valley and vast urban lands south of the Tehachapi Mountains. Runoff from the Sacramento and San Joaquin Rivers is intercepted in the delta by the state Department of Water Resources through a series of massive pumps, which divert water into the California Aqueduct that runs south along the entire length of the San Joaquin Valley. In parallel, pumps operated by the Bureau of Reclamation divert water into the Delta Mendota Canal. The flow of the Sacramento River is further supplemented by a tunnel from the Trinity River (a tributary of the Klamath River, northwest of the Sacramento Valley) near Redding. Cities of the San Francisco Bay Area, also needing great amounts of water, built aqueducts from the Mokelumne River and Tuolumne River that run east to west across the middle part of the Central Valley. Most lowlands of the Central Valley are prone to flooding, especially in the old Tulare Lake, Buena Vista Lake, and Kern Lake rivers. The Kings, Kaweah, Tule and Kern rivers originally flowed into these seasonal lakes, which would expand each spring to flood large parts of the southern San Joaquin Valley. Due to the construction of farms, towns and infrastructure in these lakebeds while preventing them from flooding with levee systems, the risk of floods damaging properties increased greatly. The Great Flood of 1862 was the worst flood that the Central Valley has experienced in recorded history, flooding most of the valley and putting some places as much as 20 feet under water. Major public works projects beginning in the 1930s sought to reduce the amount of snowmelt flooding by the building of large dams. In 2003, it was determined that Sacramento had both the least protection against and nearly the highest risk of flooding. Congress then granted a $220 million loan for upgrades in Sacramento County. Other counties in the valley that face flooding often are Yuba, Stanislaus, and San Joaquin. The Central Valley has been home to many Country, Funk, Jazz, Soul, Nu metal, and Doowop musicians. The Valley has many influences in American music mainly through the "Bakersfield Sound", the "Doowop Era" of the 1950s and 1960s, through the "R&B", music scene of the 1980s and also through the Bakersfield Rap Music Scene often referred to as Indie Hip Hop, Central California Hip Hop, West Coast Rap, Underground Rap, or Central Valley Hip Hop. The Central Valley is known for many famous musicians from Country, R&B, and Doowop to Jazz & Funk artist such as: Buck Owens, Korn, Merle Haggard, Billy Mize, Red Simpson, The Maddox Brothers and Rose, The Paradons, The Colts and the Sons of the San Joaquin. The Central Valley is also home to many west coast bands from Bakersfield, Modesto, Stockton, and Fresno to as far as Sacramento bands. The Central Valley also houses many rappers, DJs, and R&B Hip Hop artist such as: DRS, C-BO, Brotha Lynch, T-Nutty, Planet Asia, X-Raided, The Def Dames, Marvaless, Fashawn, Blackalicious, Mozzy and many more. Agriculture is the primary industry in most of the Central Valley. A notable exception to the predominance of agriculture has been the Sacramento area, where the large and stable workforce of government employees helped steer the economy away from agriculture. Despite state hiring cutbacks and the closure of several military bases, Sacramento's economy has continued to expand and diversify and now more closely resembles that of the nearby San Francisco Bay Area. Primary sources of population growth are people migrating from the San Francisco Bay Area seeking lower housing costs, as well as immigration from Asia, Central America, Mexico, Ukraine and the rest of the former Soviet Union. After English and Spanish, Hmong is the third most commonly spoken language in the Central Valley. The Central Valley is one of the world's most productive agricultural regions. More than 230 crops are grown there. On less than 1 percent of the total farmland in the United States, the Central Valley produces 8 percent of the nation's agricultural output by value: $43.5 billion USD in 2013. Its agricultural productivity relies on irrigation from both surface water diversions and groundwater pumping from wells. About one-sixth of the irrigated land in the U.S. is in the Central Valley. Virtually all non-tropical crops are grown in the Central Valley, which is the primary source for a number of food products throughout the United States, including tomatoes, almonds, grapes, cotton, apricots, and asparagus. There are 6,000 almond growers that produced more than 1.8 million tonnes in 2013, about 60 percent of the world's supply. The top four counties in agricultural sales in the U.S. are in the Central Valley (2007 Data). They are Fresno County (#1 with $3.731 billion in sales), Tulare County (#2 with $3.335 billion), Kern County (#3 with $3.204), and Merced County (#4 with $2.330 billion). Early farming was concentrated close to the Sacramento-San Joaquin Delta, where the water table was high year round and water transport more readily available, but subsequent irrigation projects have brought many more parts of the valley into productive use. For example, the Central Valley Project was formed in 1935 to redistribute and store water for agricultural and municipal purposes with dams and canals. It was intended to serve smaller farmers, with a 160 acre maximum size limit. However, this was largely ignored under pressure from large landowners. The even larger California State Water Project was formed in the 1950s and construction continued throughout the following decades. It was in the Central Valley, especially in and around Delano, that farm labor leaders Cesar Chavez and Dolores Huerta organized Mexican American grape pickers into a union in the 1960s, the National Farmworkers Association (NFWA), in order to improve their working conditions. Due to the agricultural industry's large presence in the Valley, there is concern from environmentalists about the pesticide drift and leaching in the Central Valley of California. Since the 1980s, Bakersfield, Porterville, Fresno, Visalia, Tracy, Modesto and many other towns and cities have exploded in both area and population, as housing values along the coast increased. Many people from Los Angeles and the San Francisco Bay Area relocated to growing San Joaquin Valley suburbs in search of more affordable housing while retaining employment outside the Valley. This has led to traffic congestion between their Valley residences and their Bay Area employment with accompanying air pollution. Air pollution became a principal environmental and health concern as long ago as the 1960s, and resulted in the establishment of the California Air Resources Board in 1967. Highways Interstate 5 and CA 99 run, roughly parallel, north-south through the valley, meeting at only its south end. The Interstate 80 Business Loop connects the two highways at their closest point. Interstate 80 crosses it northeast-southwest from Rocklin to Vacaville. Interstate 80 and California State Route 58 are the 2 major routes east out of the Central Valley, over the Sierra Nevada. Other routes east over the Sierra Nevada include California State Route 178, California State Route 41 to California State Route 120 via Yosemite National Park, California State Route 88 and US Route 50. Major westbound routes out of the valley are California State Route 166, California State Route 46, California State Route 152, Interstate 580, and Interstate 80. Other routes include California State Route 33, California State Route 198, California State Route 4, California State Route 130, and other smaller back roads and trails. The state water project's Oroville Dam in the Sacramento Valley provides water and power for the California Aqueduct in the San Joaquin Valley. The aqueduct runs from Clifton Court Forebay in the Delta southwards across the Transverse Ranges. The federal (Central Valley Project) includes numerous facilities between Shasta Dam in the north to Bakersfield in the south. Pacific Gas and Electric, Western Area Power Administration, and Southern California Edison have interconnected electric transmission systems connecting the north and south ends of the Central Valley (examples include Path 15, Path 26, and Path 66). BNSF (Burlington Northern Santa Fe Railway) and Union Pacific Railroad both have railway lines in the Central Valley. The BNSF Bakersfield Subdivision runs from Bakersfield to Calwa, four miles (6 km) south of Fresno. From Calwa the BNSF Stockton Subdivision continues to Port Chicago, west of Antioch. The Union Pacific Railroad Martinez Subdivision runs from Port Chicago through Martinez, Richmond and Emeryville to Oakland. The UP's Fresno Subdivision runs from Stockton to Bakersfield and traffic passes through a large and historical yard in Roseville before heading to Oregon or Nevada. Amtrak operates six daily San Joaquins trains over these lines. California High-Speed Rail, linking northern and southern California, broke ground in the Central Valley in 2015. ^ Official records for Sacramento were kept exclusively at the airport since 10 November 1941. ^ a b "California Central Valley". American Museum of Natural History. Archived from the original on October 29, 2016. ^ "Central Valley". Geographic Names Information System. United States Geological Survey. ^ "California's Central Valley: Producing America's Fruits and Vegetables". House Committee on Natural Resources. Archived from the original on June 23, 2015. ^ "Federal Agencies Release Data Showing California Central Valley Idle Farmland Doubling During Drought". landsat.gsfc.nasa.gov. Archived from the original on April 10, 2016. ^ a b c d Bittman, Mark (October 10, 2012). "Everyone Eats There". The New York Times. Archived from the original on October 13, 2012. Retrieved October 10, 2012. Central Valley, which is really two valleys: the San Joaquin to the south and Sacramento to the north. All tolled,[sic] the Central Valley is about 450 miles long, from Bakersfield up to Redding, and is 60 miles at its widest, between the Sierra Nevada to the east and the Coast Ranges to the west. ^ a b c d "A Statistical Tour of California's Great Central Valley". California Research Bureau. California State LIbrary. Archived from the original on May 3, 2009. Retrieved July 27, 2009. ^ Jennings, Joanne Elgart (November 1, 2010). "California's Central Valley Finds Itself on the Political Map". PBS Newshour. Archived from the original on January 25, 2018. Retrieved January 23, 2018. About 6.5 million people live here, making it the state's fastest growing region, according to the 2010 U.S. Census. Between 1990 and 2009, the population here grew 44 percent (compared with 24 percent growth statewide). ^ "Physiographic divisions of the conterminous U. S." U.S. Geological Survey. Archived from the original on December 5, 2007. Retrieved December 6, 2007. ^ Benke, Arthur C.; Cushing, Colbert E. (2005). Rivers of North America. Academic Press. p. 554. ISBN 0-12-088253-1. ^ "California Central Valley grasslands". Terrestrial Ecoregions. World Wildlife Fund. Retrieved November 13, 2011. ^ Minkoff-Zern, Laura-Anne (2014). "Hunger Amidst Plenty: Farmworker Food Insecurity and Coping Strategies in California". Local Environment. 19: 204–219 – via ESBCO Host. ^ "Climate of California". Western Regional Climate Center. .www.wrcc.dri.edu. Archived from the original on July 21, 2009. Retrieved July 26, 2009. ^ a b "NowData – NOAA Online Weather Data". National Oceanic and Atmospheric Administration. Retrieved April 19, 2016. ^ "WMO Climate Normals for SACRAMENTO/EXECUTIVE ARPT CA 1961–1990". National Oceanic and Atmospheric Administration. Retrieved March 11, 2014. ^ "SACRAMENTO 5 ESE, CALIFORNIA". Western Regional Climate Center. ^ "NowData – NOAA Online Weather Data". National Oceanic and Atmospheric Administration. Retrieved December 3, 2012. ^ "Station Name: CA FRESNO YOSEMITE INTL AP". National Oceanic and Atmospheric Administration. Retrieved April 22, 2014. ^ "WMO Climate Normals for FRESNO/AIR TERMINAL CA 1961–1990". National Oceanic and Atmospheric Administration. Retrieved March 11, 2014. ^ "Average Weather for Fresno, CA – Temperature and Precipitation". The Weather Channel. Retrieved September 20, 2011. ^ "Sacramento River Basin National Water Quality Assessment Program: Study Unit Description". United States Geological Survey. ca.water.usgs.gov. Archived from the original on August 13, 2009. Retrieved July 26, 2009. ^ "Restoring the San Joaquin River: Following an 18-year legal battle, a great California river once given up for dead is on the verge of a comeback". Natural Resources Defense Council. www.nrdc.org. September 17, 2007. Archived from the original on July 9, 2009. Retrieved July 26, 2009. ^ Gorelick, Ellen. "Tulare Lake". Tulare Historical Museum. www.tularehistoricalmueseum.org. Archived from the original on February 19, 2010. Retrieved July 26, 2009. ^ "Delta Subsidence in California: The sinking heart of the State" (PDF). United States Geological Survey. ca.water.usgs.gov. Archived (PDF) from the original on July 10, 2011. Retrieved July 26, 2009. ^ "Sacramento-San Joaquin River System, California". American Rivers. America's Most Endangered Rivers Report: 2009 Edition. Archived from the original on January 17, 2010. Retrieved July 26, 2009. ^ The Columbia is the largest, with an average discharge of 265,000 cu ft/s (7,500 m3/s). The Sacramento comes next with a flow of 30,215 cu ft/s (855.6 m3/s), and even though the Colorado is much longer, its discharge is only about 10,000 cu ft/s (280 m3/s) to 22,000 cu ft/s (620 m3/s) (that is before diversions started; the river is currently dry at the mouth). Other significant rivers include the Klamath 17,010 cu ft/s (482 m3/s), Skagit 16,598 cu ft/s (470.0 m3/s), Snohomish 13,900 cu ft/s (390 m3/s), and San Joaquin 10,397 cu ft/s (294.4 m3/s). ^ "California's Central Valley". National Public Radio. November 11, 2002. Archived from the original on October 16, 2010. Retrieved May 27, 2010. ^ a b Stene, Eric A. "The Central Valley Project: Introduction". U.S. Bureau of Reclamation. Archived from the original on May 27, 2010. Retrieved May 27, 2010. ^ "Ecosystem Restoration: Systemwide Central Valley Chinook Salmon" (PDF). CALFED Bay-Delta Program. Archived (PDF) from the original on May 27, 2010. Retrieved May 27, 2010. ^ "California State Water Project Overview". California State Water Project. California Department of Water Resources. April 15, 2009. Archived from the original on May 27, 2010. Retrieved May 27, 2010. ^ "California State Water Project Today". California State Water Project. California Department of Water Resources. July 18, 2008. Archived from the original on September 1, 2010. Retrieved May 27, 2010. ^ Anderson, David (July 4, 1999). "A temporary diversion". Times-Standard. Archived from the original on January 3, 2010. Retrieved May 27, 2010. ^ "The Hetch Hetchy Aqueduct". Aquafornia. August 19, 2008. Archived from the original on January 10, 2013. Retrieved May 27, 2010. ^ "Mokelumne Aqueduct". Aquafornia. August 19, 2008. Archived from the original on January 10, 2013. Retrieved May 27, 2010. ^ "Sacramento Flood Protection". Archived from the original on August 9, 2011. ^ "Hmong". Science and Environment Podcast. University of California Merced. Archived from the original on July 21, 2011. Retrieved September 20, 2010. ^ Reilly, Thomas E. (2008). Ground-Water Availability in the United States: U.S. Geological Survey Circular 1323. Denver, CO: U.S. Geological Survey. p. 84. ISBN 978-1-4113-2183-0. ^ Pollan, Michael. "Our Decrepit Food Factories". Archived from the original on November 18, 2011. Retrieved November 13, 2011. ^ Purdum, Todd S. (September 6, 2000). "California's Central Valley. Where the Mountains Are Almonds". The New York Times. Retrieved December 16, 2008. The state's 6,000 growers produce more than 600 million pounds a year, more than 70 percent of the world's supply and virtually 100 percent of domestic production. ^ "Production/Crops for almonds with shell" (database). Food and Agriculture Organization of the United Nations, Statistics Division, FAOSTAT. 2013. Archived from the original on November 22, 2016. Retrieved December 22, 2015. ^ Parker, Timothy S. (October 27, 2011). "United States Fact Sheet: US agriculture income population food education employment unemployment federal funds farms top commodities exports counties financial indicators poverty food security farm income Rural Nonmetro Urban Metropolitan America USDA organic Census of Agriculture". Ers.usda.gov. Archived from the original on June 26, 2012. Retrieved November 13, 2011. Wikimedia Commons has media related to Central Valley of California. This page was last edited on 3 April 2019, at 17:02 (UTC).